How this stay-at-home mum stays sane and has fun one day at a time. A friend of mine has recommended a book which sounds absolutely amazing and massively up my alley. It’s called Happier At Home by Gretchen Rubin and is about decluttering in both the physical and mental sense of the word. I can’t wait to read it. I really need to read it! You see, we tore down half the walls in our house and created an open-plan living area which seemed a good idea at the time. Now we have two kids and that dream area is a disaster zone. Although everything has its place, the little hyperactive midgets don’t give a brass razoo about tidiness. The toddler is a tornado. The baby is a bomb going off. Together they are a formidable team. When we just had Henry, we put out a few toys and rotated them, keeping most of his stuff in his room. I had the time, you see, to focus on keeping his playtime fresh and exciting. Poor Annie doesn’t get as much thought put into her play – no wonder she spends hours rummaging through the bathroom cabinet, playing with hairspray and sucking on shaving gel. 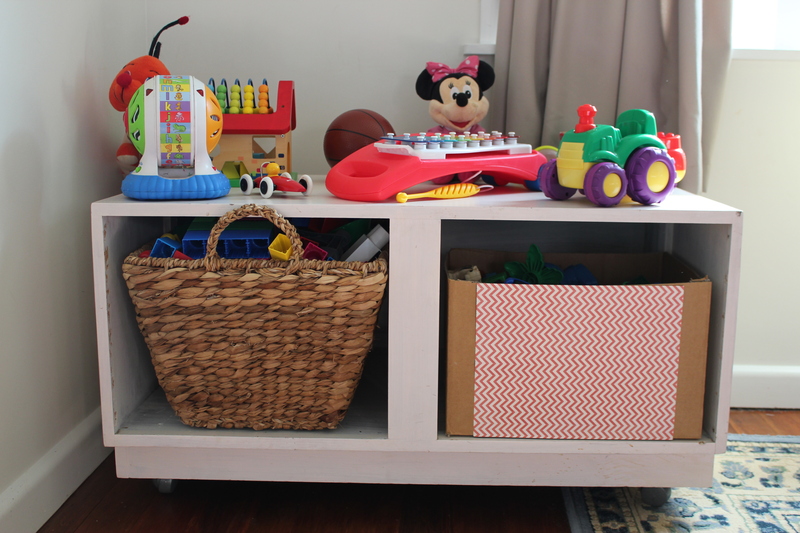 So yesterday, spurred on by my friend’s talk of decluttering, I decided to reclaim the lounge by getting rid of the ‘toy corner’ – a table piled verrrry high with toys the kids largely ignored. I replaced it with the unit pictured above, which I’ve been meaning to upcycle. I’ll paint it and add new baskets but for now I’m using what I have to store Henry’s Duplo and Mega Bloks. How simple! Just like that, the living room feels less cluttered and more organised. I’m ‘happier at home’ already – imagine how I’ll feel when I’ve actually read the book!